An artist's interpretation of NASA's Chandra X-Ray Observatory, which launched in 1999 and has received an extended mission through at least 2013. 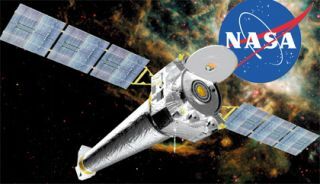 After adecade of scanning the universe, NASA?s orbiting Chandra X-ray Observatory hasa new lease on life ? one that could extend its mission through 2013, andpossibly longer. NASAofficially extended the 10-year-old Chandramission by extending its science support contract by $172 million, which willfund the effort through 2013 and bring its total base cost up to $545 million.Options for two more life extensions for the healthy space telescope couldincrease its value to $913 million, NASA officials said. ?I thinkit?s very good news,? said astronomer Roger Brissenden, manager and flightdirector of the Chandra X-ray Center overseeing the space telescope?s scienceoperations. ?It shows they really do have confidence that the spacecraft ishealthy and able to do good science.? The ChandraX-ray Observatory was initially built for a five-year mission that wasextended by five more years in 2004. NASA's Marshall Space Flight Center in Huntsville, Ala., manages the mission. Chandralaunched in 1999 aboard the space shuttle Columbia and is one of NASA?s GreatObservatories ? an exclusive group of space telescopes that includes theiconic Hubble Space Telescope, the infrared Spitzer Space Telescope, and thenow de-orbited Compton Gamma-ray Observatory. BecauseChandra focuses its telescopic eye solely on the high-energy X-ray signals inspace, it has been an invaluable tool for understanding the structure andevolution of the universe, researchers said. Without it, astronomers would onlysee part of the cosmic picture, they added. ?Theuniverse we live in is a multi-wavelength universe, and to understand theuniverse we need to see [the entire spectrum of light],? Brissenden toldSPACE.com. ?Chandra is just critical because it provides the high-energycomponent of that picture.? In additionto the latest extension, NASA also announced the potential for two moreextensions ? each three years long ? that could boost the Chandra telescope?sscience life to Sept. 30, 2018, with an extra year for follow-up studies,pushing the mission into its second decade. The extrathree-year extensions, if approved, could add another $368 million in fundingfor Chandra?s science team, bringing the space telescope?s total mission costsince 1999 to its potential $913 million total, NASA officials said. Brissendensaid a study of Chandra?s health has found it in extremely robust shape despiteits more than 10 years in space. The orbiting telescope?s power and propulsionsystems have enough reserves to last well beyond 2013 to at least 2018 andmission scientists have high hopes that they?ll get the chance to use them. ?There?senough fuel for many tens of years,? Brissenden said. ?The 20-year missionwould be within reach. ?